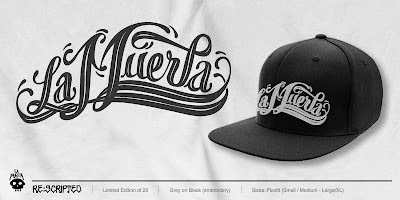 The “Scripted” design featuring custom typography by JohnnyCrap was originally released by La Muerta on a hoodie, which naturally sold out due to how rad it looks. Making an encore performance as “Re:Scripted” on a Flexfit hat (glad it wasn’t a snapback), the design looks like it was made specifically to grace the two front panels on the crown of this cap. The proportions are perfect, and I always think word marks look great on headwear. The hat is limited to just 25 pieces, and is one of two pre-orders currently available in the La Muerta shop. The “Q.E.P.D.” t shirt designed by xADx is also new, and will ship out in August as well.